A while back I stumbled upon the most researched, thorough, useful article I believe BuzzFeed has ever published: The Clean Eating Challenge. The concept wasn’t new. It was a diet plan for a two week “detox” that was supposed to make you feel amazing. Normally I am weary of anything claiming to detox you, because that’s what livers are for. I’m also weary of anything suggesting a short-term diet will have long-term effects. However this particular eating challenge excited me because of it’s completeness. Many diet plans give a list of restrictions or rules with a few suggested recipes. Some offer complete meal plans with no shopping guides, meaning you have to go through each meal individually to figure out what to buy. Other plans list ingredients to buy, but no provision for what to do with the other 3/4 of the jar of sour cream you invariably end up with. This challenge had it all. 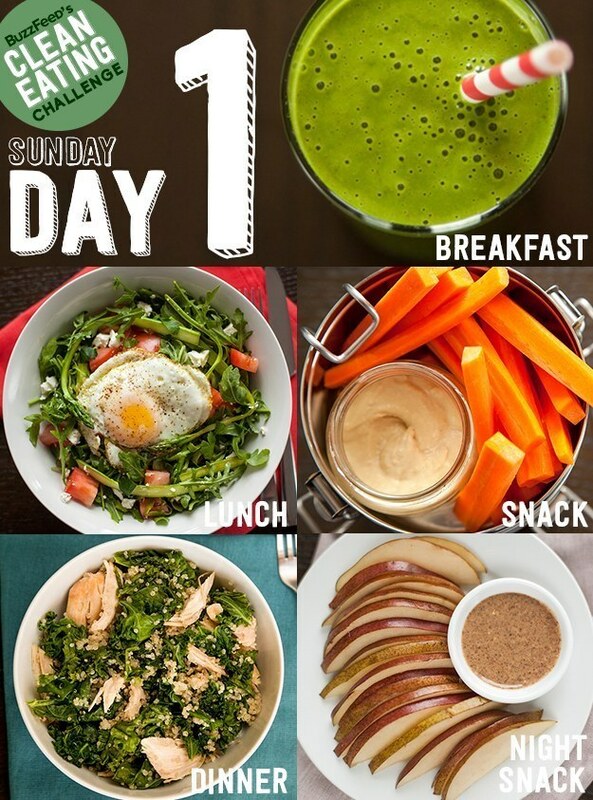 There were meals and snacks for every day for 14 days. There were recipes with instructions as well as Pinterest-ready photos of the completed dishes. There were full shopping lists of everything you needed to get at the store, split into two trips you had to make at specific times. They even went so far as to warn you when to take things out of the freezer to defrost, and which meals would be using leftovers from other meals (in case you were considering switching any around). Hell, there was even a list of required kitchen instruments. At the time I found it, I was at a bit of a loss nutritionally. I wanted to change my diet but I didn’t know how. And I didn’t know why. Something about it seemed off, like I should be able to have a diet that was more nutritious or that gave me more energy or cost less money or was easier to prepare. I didn’t even know what I was looking for, just that I hadn’t found it. There was something appealing about having zero choice or decision for two solid weeks. I would eat what was on the plan, nothing more, nothing less. I would have to, because I would have a mountain of produce in the fridge that would go bad if I dared stray from the path. Unfortunately the main appeal of the plan was also its main problem. In order to do it right I needed two uninterrupted weeks. I couldn’t have parties or barbecues or work events that might require me to eat food. I also had to start the plan on a Sunday in order to have lunches I could pack for work while using up the proper leftovers. While there was a provision in the plan for deviations, I couldn’t see how I would make it work without wasting food. And for me, wasting food (and therefore money) was not an option. I looked at my calendar and found a set of weeks about a month away when I could do it. But then things came up. I moved my food challenge dates. It happened again. And again. Finally I was fed up with pushing it back. I wanted to do this little food experiment and I was never going to do it if I kept waiting for 14 uncomplicated days. I printed out the entire 50 page plan and started combing through it. I figured out that I could skip the first two days and start on Tuesday with only a few minor adjustments. I could, and would, make it work. The final step in my preparation plan was writing and publishing this post. I’m doing so to guarantee at least some small level of accountability. The challenge starts on September 30th, which means you should see a follow-up post by October 16th, maybe October 20th at the latest. If you don’t hear anything from me by then, I expect to hear something from you.